The Atmospheric Chemistry Experiment (ACE) is a satellite mission on board the Canadian satellite SCISAT, that takes measurements of the Earth's atmosphere. The measurements consist of spectra and images that are used to investigate chemical and dynamical processes in our atmosphere, with a particular emphasis on ozone depletion in the Arctic stratosphere. Dr. Peter Bernath from the Department of Chemistry at the University of Waterloo is the Mission Scientist, which involves the collaboration of members from several universities, industries and other organizations in Canada and around the world. On August 13, 2013, SCISAT celebrated its 10th anniversary in orbit. SCISAT was originally designed for a 2-year mission but has now surpassed expectations and continues to record measurements of Earth's atmosphere. 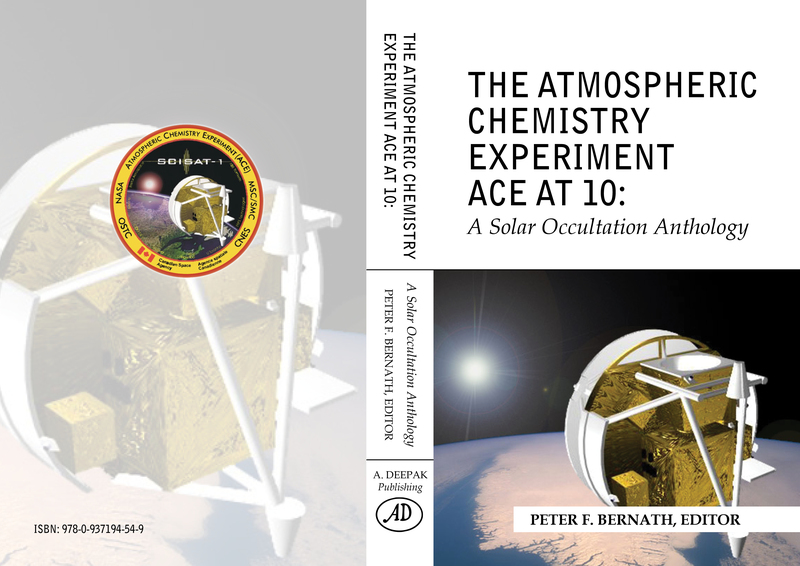 To commemorate this special occasion, a tenth anniversary book has been published entitled The Atmospheric Chemistry Experiment ACE at 10: A Solar Occultation Anthology. Funding for the ACE mission is primarily provided by the Canadian Space Agency.